Description: Considered evolution of the theory and practice information and psychological effects in preparing for and conduct of combat operations from ancient times to end of the nineteenth century, has been justified for the use and efficiency ably organized work on the effects of moral and psychological potential enemy, defined the lessons learned to modern military. Zaborovskyi, V.V. and Zheltoborodov, O.M. 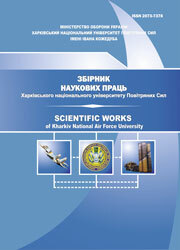 (2009), “Formuvannia osnov informatsiino-psykholohichnoho vplyvu na suprotyvnyka u viinakh pershoho ta druhoho pokolin”, Scientific Works of Kharkiv National Air Force University, Vol. 2(20), pp. 141-145.